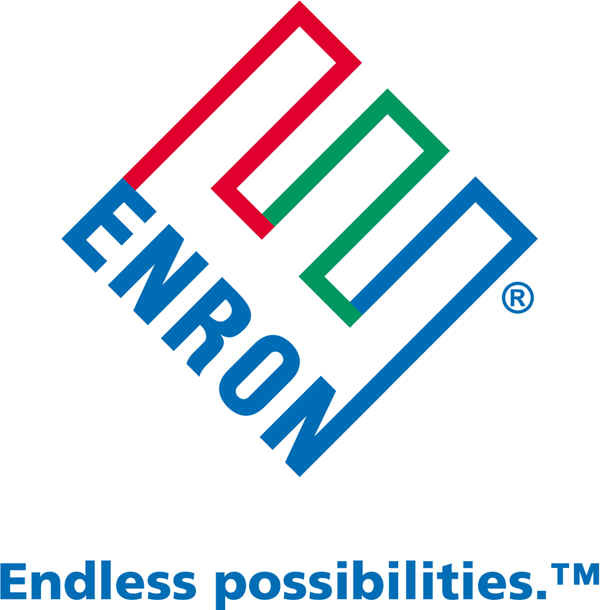 Enron Corporation Logo. Image available on the Internet and included in accordance with Title 17 U.S.C. Section 107. ENRON CORPORATION. Enron, a corporation headquartered in Houston, operated one of the largest natural gas transmission networks in North America, totaling over 36,000 miles, in addition to being the largest marketer of natural gas and electricity in the United States. Enron managed the world's largest portfolio of natural gas risk management contracts and pioneered innovative trading products. The company was on Fortune's "Most Innovative" in the United States listing for several years running and reached #7 on the Fortune 500 list in 2000. Its bankruptcy in December 2001 was the largest such filing in United States history. The name Enron became synonymous with corporate greed and corruption, and its demise cost investors and employees over $70 billion in lost capitalization and retirement benefits. Kenneth Lay, CEO of Enron. Image available on the Internet and included in accordance with Title 17 U.S.C. Section 107. Enron was formed by a merger between Houston Natural Gas (HNG) and InterNorth. HNG was formed from the Houston Oil Co. in the 1920s and provided gas to retail customers in Houston. In 1976 it sold its retail gas business in Houston to concentrate on gas exploration and production and other businesses. By 1984 HNG had assets of $3.7 billion, sales of over $2 billion, and profits of $123 million. InterNorth began as Northern Natural Gas Company, organized in Omaha, Nebraska, in 1930. When InterNorth, with one of the nation's premier pipeline networks with revenues of $7.5 billion in 1984, found itself the potential takeover target of corporate raiders, CEO Sam Segnar sought to buy out HNG, and a deal was announced in May 1985 in which InterNorth would acquire HNG for $2.4 billion. The arrangement stipulated that the merged entities would be known as HNG/InterNorth and be headquartered in Omaha with Segnar as chairman and CEO. 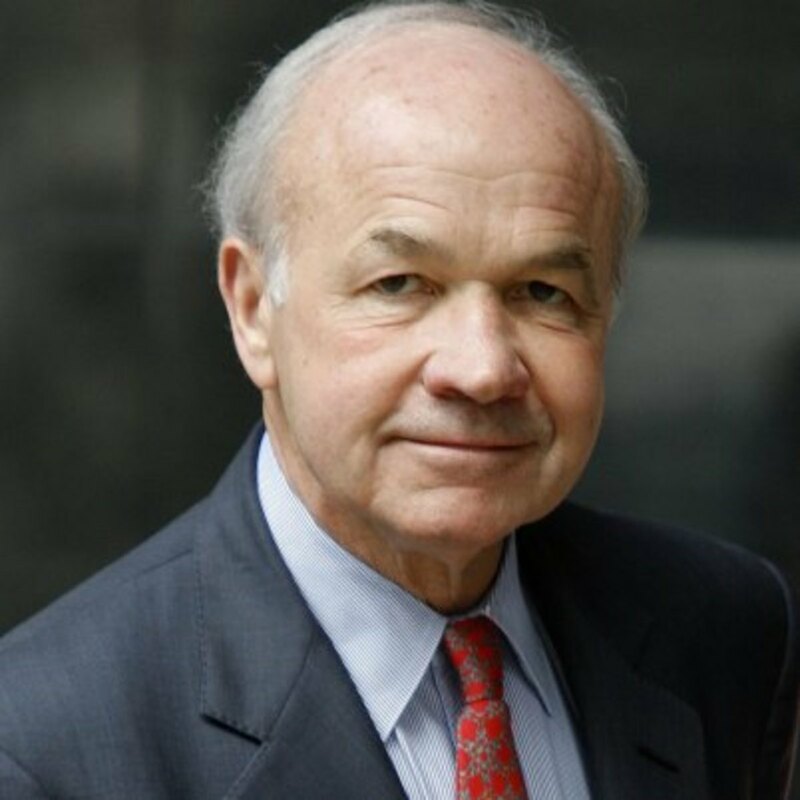 However by 1986 Segnar had retired, Kenneth Lay was chairman and CEO, and the company was renamed Enron with corporate headquarters in Houston. The new company had the second largest pipeline network in the United States with over 36,000 miles of pipe stretching across the continent and north into Canada. Federal Energy Regulartory Comission Seal. Image available on the Internet and included in accordance with Title 17 U.S.C. Section 107. In 1984 the Federal Energy Regulatory Commission eased some of the pricing restrictions on natural gas and allowed local gas distribution companies to buy gas from anywhere and anyone. Ken Lay rapidly gained a reputation for effectiveness during this period by negotiating Enron's escape from some of the more burdensome and expensive "take-or-pay" contracts from the 1970s. In 1989 Enron created a new way to market natural gas to consumers—the Gas Bank—a concept developed by Jeff Skilling, a consultant at McKinsey & Co. The Gas Bank served as an intermediary between buyers and sellers of gas and became a success. Natural gas was now traded as a commodity, and Skilling left McKinsey for Enron's trading operation in 1991. Enron began to view itself primarily as a trader rather than as a gas producer and began to divest itself of heavy pipeline assets; by 2000 it owned five thousand fewer miles of pipe than in 1985, but its gas financial transactions represented over twenty times its pipeline capacity. Enron extended the natural gas model to become a financial trader and market maker in electric power, coal, steel, paper and pulp, water, and broadband fiber optic capacity. In 1994 Congress gave the states the authority to deregulate gas and electric utilities. The newly opened California market was a major target, and Enron spent $100 million a year to generate business there. That effort was cancelled in 1999, but Enron continued to supply wholesale power to California. The ensuing power shortage in California in 2000 rocked the state, and Enron was accused of manipulating supplies. Eventually two Enron traders were indicted for criminal fraud. Azurix Logo. Image available on the Internet and included in accordance with Title 17 U.S.C. Section 107. In the mid-1990s it appeared that water, like natural gas, was on its way to being deregulated. In July 1998 Enron purchased Wessex Water of Great Britain for more than $2 billion and renamed the new business Azurix. However, economies of scale did not work because there were no means to interconnect the supply and transmission facilities. Azurix was liquidated within two years after its public offering. Enron financed Azurix's debt with Special Purpose Entities (SPEs) called Marlin and Osprey, which kept the debt off Enron's books for a period but was eventually recognized during Enron's last few months before bankruptcy in 2001. In January 2000 Enron announced its entry into the broadband fiber optic business and created Enron Broadband Services. Enron Online, launched in late 1999, became the largest e-commerce site in the world. Many analysts saw this expansion as a logical extension of Enron's commodity trading and transmission business. However there was an oversupply of capacity, and technological innovation also more than doubled the carrying capacity of fiber already in the ground. Within months of Enron's announcement, there was a glut of "dark fiber" (unused fiber connections) across the country, and numerous Internet startups that had promised to swallow much of the anticipated bandwidth failed, causing prices to fall by fifty percent. It was estimated that Enron lost over $1 billion in its broadband venture. Nonetheless, Enron was able to use accounting mechanisms to record a profit of over $100 million on a deal with Blockbuster that, in reality, never saw a single dollar of revenue. Jeff Skilling, former CEO of Enron. Image available on the Internet and included in accordance with Title 17 U.S.C. Section 107. Enron Stocks Chart, 1984-2002. Image available on the Internet and included in accordance with Title 17 U.S.C. Section 107. Enron's increased reliance on trading also brought about some basic changes in accounting procedures. Under Skilling the trading operation adopted mark-to-market accounting in which the present value of anticipated revenue is realized and the expected costs of fulfilling the contract are expensed once a contract is signed. Unrealized gains and losses in the market value of the long-term contracts were required to be reported later as a part of annual earnings when they occurred. Mark-to-market accounting retains a valued place in commonly accepted accounting practices. Enron and its outside auditor, Arthur Andersen, took the practice to previously untested parameters. The stock rose 56 percent in 1999 and another 87 percent in 2000; Enron was losing money on its operations but using certain accounting practices to appear profitable and stable. Enron also made frequent and heavy use of prepaid agreements which allow a company to raise cash, much like a loan, but not include the liability on the balance sheet. In 2001 Enron signed over $5 billion worth of prepaid agreements as it attempted to raise cash and bury debt. In the early 1990s Enron also began making heavy use of SPEs, shell firms created by a sponsor but funded by independent equity investors and debt financing. Enron used SPEs to fund or manage risk associated with specific projects and assets, and at first Enron set up the SPEs correctly. Enron has been accused of using strong-arm tactics with investment bankers that did large amounts of business with Enron to persuade the bankers to invest in the SPEs. Often prior arrangements included assurances from Enron that an investor's commitment would be for a relatively short period, at which time Enron would find a new investor to assume the third-party role, allowing the initial investor to secure a large profit. When Enron had difficulty finding replacement independent investors, however, it has been asserted that it utilized key management personnel for this role, which cast doubt over the issue of control of the entity. Enron used SPEs as hedge funds to lock-in mark-to-market profits or to hide losses of underperforming assets; it was capitalizing with its own stock. In effect, it was hedging assets with itself. Overseas Private Investment Corporation Logo. Courtesy of the Office of Inspector General. Image available on the Internet and included in accordance with Title 17 U.S.C. Section 107. An important relationship began in 1989 when Enron received $56 million in loans and guarantees for a plant in Argentina from the Overseas Private Investment Corporation (OPIC). OPIC guarantees loans for companies investing in overseas projects and uses its resources to generate investment in areas that may be politically advantageous for United States interests but unattractive for sound business practices. Between 1993 and 2000 Enron was the recipient of over $2.2 billion in loans and insurance for more than a dozen projects ranging from power plants to gas pipelines to gas extraction plants. By 2001 complaints about the opaqueness of Enron's financial reporting were raising concerns. The Raptors, entities which had been created in 2000 to remove troubled international assets from Enron's books, were nearly insolvent. In March the Raptors were restructured which allowed Enron to hide another $200 million in losses. Whitewing and Osprey SPEs had liability points triggered when Enron's stock fell below forty-seven dollars, which happened in July 2001. In 2000 Enron had reported $4.8 billion in operating cash flow. In reality Enron had very little real cash flow. The $100 billion in revenue that Enron had reported in 2000 was primarily revenue from trades in which cash did not change hands. These transactions, however, all needed to be collateralized, demanding a huge amount of affordable credit for Enron. Credit rating services were taking a hard look at Enron's financial position. At the same time prices in the fiber market were plummeting, yet Enron insisted that its business plan for broadband was on target. This improbable assertion generated much skepticism among analysts which further increased inspection of Enron's finances and depressed the stock price. Enron Stocks Chart showing the dramatic drop in 2001. Image available on the Internet and included in accordance with Title 17 U.S.C. Section 107. The second quarter 10Q report filed with the SEC showed a negative cash flow of $1.3 billion YTD. The Marlin SPE, which had been used to conceal Azurix losses, had a payment due to investors at the end of 2001. Enron was able to refinance the obligation in July for $1 billion, however the entire note was due if the stock price fell below thirty-four dollars. Energy prices continued to fall which meant that Enron would have to begin refunding $2 billion in deposits. 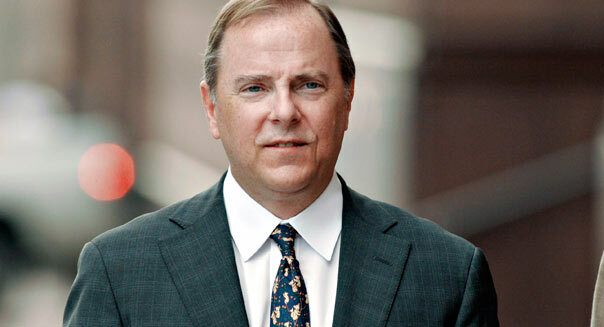 The rapidly deteriorating situation at Enron led to Jeff Skilling's resignation in July, an announcement withheld from the public until August. Kenneth Lay reassumed the role of chief executive. Skilling's abrupt departure along with other major personnel changes made analysts suspicious, and they began to look even more closely at Enron's finances. Following a five-dollars-per-share decline the day of the Skilling announcement, the price dropped to twenty-five dollars per share on September 12 after the 911 attacks. 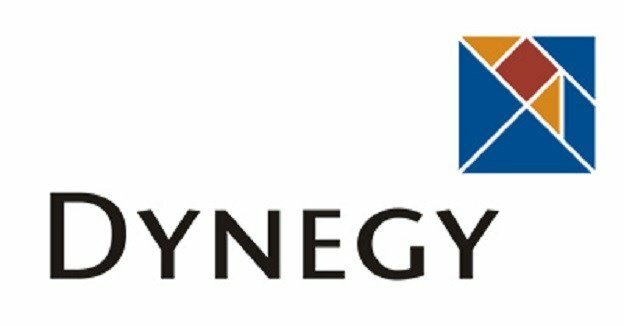 Dynegy Logo. Image available on the Internet and included in accordance with Title 17 U.S.C. Section 107. Stocks continued to fall in October and hit a low of $20.65 a share. Enron replaced Andrew Fastow as CFO. A liquidity crisis immediately ensued, and Enron was forced to draw upon $3 billion in backup credit lines which only lasted a few days due to Enron's short-term commercial paper. The collapse of the stock price now made billions of dollars of obligations due immediately. Enron secured another $1 billion in loans using the remaining pipelines as collateral, the only asset that Enron had left that was deemed worthy to use as collateral. In November Enron entered merger negotiations with Houston-based Dynegy, Inc., and Enron's stock rose to about ten dollars. Enron received $1.5 billion in cash from Dynegy as well as the first $550 million from the pipeline loan. However, Enron's third-quarter loss was restated to be $664 million, and Enron's fourth-quarter prospects appeared dismal. The merger was reviewed when credit rating services lowered Enron's rating to just above junk status which triggered an immediate repayment demand of $690 million for an SPE called Rawhide. The reduced rating meant that Enron now had more than $9 billion in loans due in 2002. The Dynegy deal collapsed, and banks refused to extend any further credit. On December 2, 2001, Enron filed for protection under United States bankruptcy laws, at that time the largest such filing of its kind in United States history. Sarbanes-Oxley Act, 2002. Image available on the Internet and included in accordance with Title 17 U.S.C. Section 107. Congressional response to the debacle, in addition to highly-publicized hearings that sought to uncover the underlying reasons for the collapse, included the passage of the Sarbanes-Oxley Act. The legislation, passed in July 2002, required more transparency in dealings between executives and corporations, provided more stringent penalties for fraud, made corporate officers personally liable for the accuracy of financial reports, required more independence for auditing firms, and legislated more access for investors to internal financial control procedures. 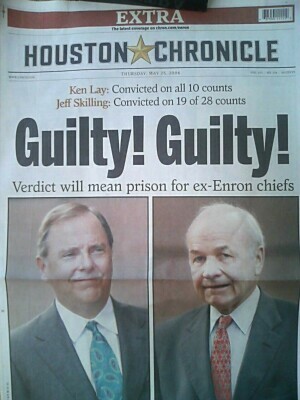 Newspaper Headline featuring Lay and Skilling after Enron scandal. Image available on the Internet and included in accordance with Title 17 U.S.C. Section 107. Twenty-two Enron executives and partners pleaded guilty or were convicted of criminal charges for their roles in Enron's collapse. Arthur Andersen was found guilty of fraud; the conviction was later overturned on appeal, but the reversal did not come before the firm was forced to dissolve. Several Andersen partners were also personally convicted of crimes committed during their work at Enron. While several Enron executives received probation, others received lengthy prison terms, including CFO Andrew Fastow; accounting chief Richard Causey; CEO of the trading unit, David Delainey; and treasurer Ben Glisan. Former Chairman Ken Lay and CEO Jeff Skilling were found guilty in May 2006. Skilling, guilty of nineteen counts of security and wire fraud, was sentenced to more than twenty-four years in federal prison and began serving his term in December 2006. Ken Lay died suddenly in July 2006 while awaiting sentencing. Federal precedent calls for convictions to be voided if the accused dies before the appeals process can be exhausted. Consequently, Lay's conviction was voided in November 2006. At that time the Judiciary Department announced plans to pursue Lay's estate in civil court in an attempt to recover some of Enron's lost billions. The twenty thousand employees of Enron lost most of their savings and pension plans. Legal efforts managed to recoup a small portion of the employee-invested funds, but the bulk of the plan's resources were tied to the price of Enron stock. As the stock descended to worthless status, so did the economic security of the employees' funds. In 2004 Enron's name was changed to Enron Creditors Recovery Corporation with the mission to liquidate any remaining assets and operations of Enron. Upon completion of its mission and final distribution to creditors, the company would no longer exist. Robert Bryce, Pipe Dreams: Greed, Ego, and the Death of Enron (New York: PublicAffairs, 2002). Loren Fox, Enron: The Rise and Fall (Hoboken: Wiley & Sons, 2003). Paul M. Healy and Krishna G. Palepu, "The Fall of Enron," Journal of Economic Perspectives 17 (Spring 2003). Bethany McLean and Peter Elkind, The Smartest Guys in the Room: The Amazing Rise and Scandalous Fall of Enron (New York: Portfolio, 2003). Alan Rubenstein and Thomas Weirich, "Accounting Issues at Enron," CPA Journal 72 (December 2002). Mimi Swartz with Sherron Watkins, Power Failure: The Inside Story of the Collapse of Enron (New York: Doubleday, 2003). Handbook of Texas Online, Michael Frontain, "ENRON CORPORATION," accessed April 20, 2019, http://www.tshaonline.org/handbook/online/articles/doe08.